A nutty, crunchy mix of nuts and nutrition! 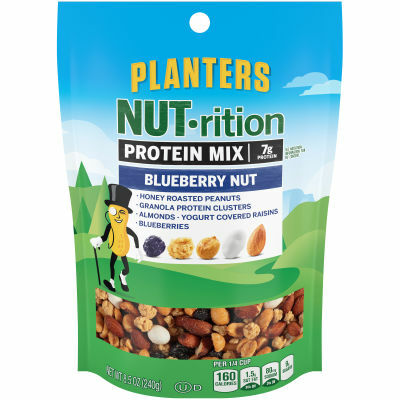 Sweet and chewy blueberries and nectarous honey roasted peanuts with protein filled granola clusters make these bags of nuts a treat to savor!For times when you are on a time crunch and can't afford a decent breakfast, just grab two bags of Planters NUT-rition protein mix for your breakfast and munch one at lunch, it will make you feel energized throughout your day! Serving size 1/4 cup (32g).